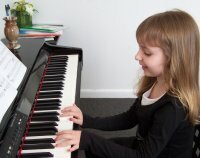 $720 per semester for weekly half hour lessons. Students are permitted 2 makeup lessons per semester. 24 hour cancellation notice required to take makeup. Check out the Single Lesson option below to book just one lesson at a time. Request availability by clicking here! Great option if you'd like to try a few lessons, try different instruments, or don't want to commit to a regular lesson time. Improves academic skills by studying patterns and using critical thinking. Develops coordination, fine motor skills, and encourages ambidexterity. Refines discipline, patience, and perseverance through practice. Teaches self-confidence and turning negative feedback into positive changes. Introduces other cultures and explores periods of history.